it was 1990/91 and i was sitting in desert storm. i think i was eating some goodness in my mre (meals ready to eat) that came from wayne candies. i was so bored and lonely. i was reading all the packages and saw that the candy was made in indiana. i beleive it was wayne candies. it was some goodness. it was memories. it was nice. whomever was making the candies for the mre's thank you. thank you for some bright spots in a nasty day. thank you for posting on the package you were from indiana to this indiana girl. and i also thank the candy for understanding that i had some spots in me that needed sweetness. 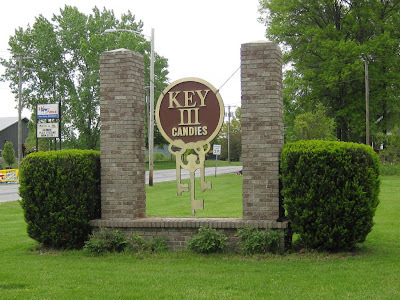 I've driven past Key III Candies many times over the years and have always wondered what it was about. I never even had their candies until this Christmas when we got a bag of chocolate covered peanuts for a gift. It is neat to learn about some place I knew nothing about. Thanks for writing about it. Years ago a parent of a classmate worked at Wayne Candies and would occasionally share some of the "imperfect" candy that was brought home from work. I also recall several times when at my aunt and uncle's (who were your former neighbors) having "rejected" Archway Cookies. But I don't know where they got them, as I don't recall either of them working at Ellison Bakery. They were a treat though, as Archway was kind of a premium brand and my parents seldom bought them. Besides, mom's homemade cookies were better anyways! Key III is still open and still has their outlet store! Same location you remember as a kid. WOW.. So glad you blogged on this.. I used to work there too, from 1995 - 1996, The "younger" guys running the place nicknamed me "Hoobuck" since I was a relocated Buckeye into Hoosier territory.. They were and I bet still are a great company to work for. It was always fun to be able to go out on the line and snag a piece of candy. 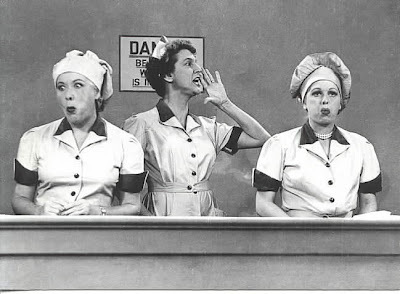 And your picture from Lucile Ball is perfect.. That is exactly what I always thought of. Don't know if you Mom was still there when I was but I am so glad That they are still making candy.. Sounds like a road trip in the future. I'm the grandson of the founder of Wayne Candies, the predecessor of Key III. My uncle, Richard and John Bleke, both who worked at Wayne, started Key III when Wayne Candies was sold in the early 70's. It's wonderful to see that it is still around and thriving. I, too, went on many tours of both Wayne Candies and visited my uncle at Key III (which was a short 10 minute bike ride from my house). Thin mints was always my choice. Keep supporting candy in the Fort! This is the good blog with good images and good details. Please keep on posting the more stuff. I will like to hear more from you. I drove by the other day and it was closed, shut down. Have they relocated as i would love to visit. Thanks for any help. Are they still open in town at another location Thank you. 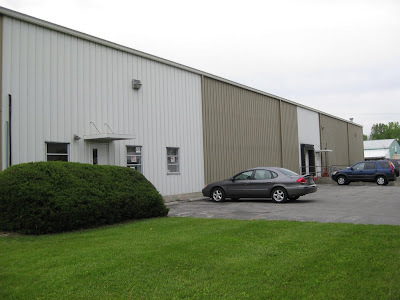 I am currently employed by a company that leases space in the old Wayne(BUN)Candy building! I am on a quest of sorts, I'm looking to find PHOTOS taken of the INSIDE of the plant while it was in operation. The Allen County Public Library, The Fort Wayne Historical Society and the Journal-Gazette, "DO-NOT" have any of these kind of photos that I'm looking for. I'm still waiting to hear back from the "THE SENTINAL"(the other Fort Wayne Newspaper) Would you happen to know if ANY photos exist? I would just like to see how that place looked like on the inside! Thank you. My Aunt worked at Wayne Candies in the late 60's and early 70's. The rejects candy was as good as the new. We didn't care. I especially liked the bun candy, with or without the maple.